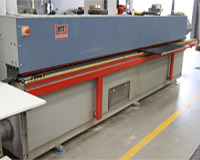 ACRIFAB uses the Austrian OTT edge banding machinery. This gives us the ability to edge timber boards with paper based edging or the 2mm thick ABS “tough edge” to resist most knocks and chips. Whilst there is a marginal cost saving by using the paper based edging, in the long term it is far more effective to use the “tough edge”. We carry matching colours of the ABS “tough edge” edging to suit all our standard range of timber colours.